Sauteed shrimp, scallop, crab meat, with mixed vegetables in a white sauce. 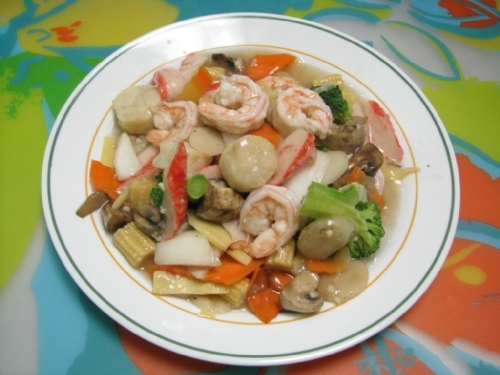 Sauteed shrimp, chicken , scallops and vegetables in a sweet sour and hot brown sauce. Sauteed beef with onions, snow peas and carrots in a sweet spicy sauce. Lightly breaded and deep fried shrimp sauteed with green and red pepper in a spicy red sauce. Menu items and prices are subject to change without notice, No Personal Checks Please.